The commission recommended an apology similar to that offered by the Pope to Irish victims of sexual abuse in 2010. In 2015, Pope Frances issued an apology in Bolivia to Indigenous peoples in the Americas for the "grave sins" of colonialism. Bishop Lionel Gendron, president of the Canadian Conference of Catholic Bishops, today released a letter to the Indigenous Peoples of Canada saying Pope Francis has not shied away from acknowledging injustices faced by Indigenous peoples around the world, but that he can't personally issue an apology for residential schools. 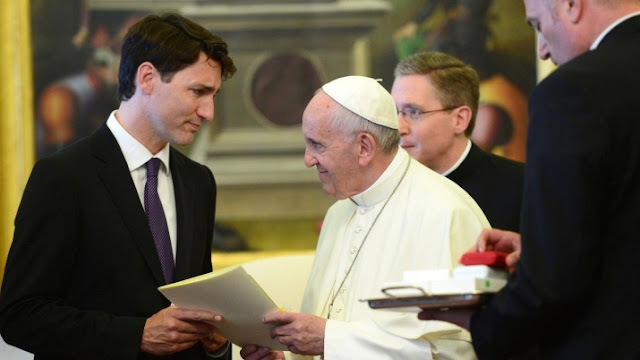 "The Catholic Bishops of Canada have been in dialogue with the Pope and the Holy See concerning the legacy of suffering you have experienced," Gendron wrote. "The Holy Father is aware of the findings of the Truth and Reconciliation Commission, which he takes seriously. As far as call to action .58 is concerned, after carefully considering the request and extensive dialogue with the bishops of Canada, he felt that he could not personally respond." "Hearing an apology directly from Pope Francis would be an important act of healing and reconciliation, much like his apology delivered to the Indigenous peoples of the Americas in 2015," Bellegarde said. Trudeau's office redirected questions about this latest development to Crown-Indigenous Relations Minister Carolyn Bennett, who said Canada won't give up on the idea yet. "The commissioners recommended this as an important part of healing reconciliation for the survivors," Bennett said in an emailed statement. "We will continue to advocate for this call to action." For more than a century, the federal government's church-run residential schools operated in an effort to assimilate Indigenous children by forcing them into schools where they were not allowed to speak their languages or engage in Indigenous cultural practices. Almost two-thirds of the 130 schools were run by the Catholic Church. Responses to "Pope says he can't personally apologize for church role in residential schools"